Wanna know my secret to longer lasting flawless make up? Ok, it’s not really THAT secret, in fact when I googled it I was surprised by the number of threads about it and even more surprised by the reluctance of so many to try it. So what am I talking about? I’m talking about the super wonderful Lanacane. Don’t squeak like a balloon when you walk? 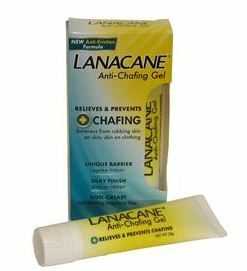 Well neither do I but this anti-chafing gel works wonders as a make-up primer, if you can get past the initial embarrassment of purchasing anti-chafing gel. Trust me, it’s worth it. My make-up glides on and stays put all day thanks to this little lovely. Our US cousins sussed this out ages ago when they realised that Monistat (the US equivalent of Lanacane) has very similar ingredients to a certain high end make-up primer. However it seems we’re more than happy to splash the cash to spare our blushes at the counter, which is more than a little silly. So for all those girls I’ve seen on forums and blogs who are scared to try this, I implore you to ignore the odd balloon animal adverts and take the plunge. So how does it compare to the top end make-up primers? Appearance: Ok, so it may not look pretty in your make-up bag but if you can look past the bright yellow packaging you’re on to a winner. Application: A little goes a long way with this beauty, which means there’s lots of life in that little tube. Great news when you consider how fresh your make-up looks with this as a base. Staying power: An 8 hour day is no problem with this little beauty. Ingredients: Cyclopentasiloxane, Cyclopentasiloxane Dimethicone/Vinyl Dimethicone Crosspolymer and Corn starch. Appearance: Ok, let’s face it, the packaging is slick, but is it really worth an extra £17? Application: Glides on smoothly though I find myself needing to use a little more of this product to get an even spread. Again, my make-up applies easily and looks radiant. Staying Power: I expected this to be just as good as Lanacane, given the similar ingredients and that it’s designed to be a primer, however I found my nose looking shinier than usual half way through the day…not good! Ingredients: Cyclopentasiloxane, Dimethicone Crosspolymer, Dimethicone, Trisiloxane, Silica, Dimethicone/ Vinyldimethicone Crosspolymer, Ethylhexyl Salicylate, Retinyl Palmitate, Tocopheryl Acetate, Carthamus Tinctorius (Safflower) Seed Extract, Propylene Glycol, Water (Aqua, Eau), Vitis Vinifera (Grape) Seed Extract, Cola Acuminata Seed Extract, Camellia Oleifera Leaf Extract. When I began this comparison, I honestly thought the price would be the only difference, so I was surprised to find that Lanacane seems to have better staying power too. For me it’s an obvious choice and I’m happy to push aside my pride for this inexpensive beauty find. Apologies for the lack of comparison pics, but iphone pics don’t tend to show up enough to provide a worthy comparison.